Inflammatory lung disease is the major cause of morbidity and mortality in cystic fibrosis (CF); understanding what produces dysregulated innate immune responses in CF cells will be pivotal in guiding the development of novel anti-inflammatory therapies. To elucidate the molecular mechanisms that mediate exaggerated inflammation in CF following TLR signaling, we profiled global gene expression in immortalized human CF and non-CF airway cells at baseline and after microbial stimulation. Using complementary analysis methods, we observed a signature of increased stress levels in CF cells, specifically characterized by endoplasmic reticulum (ER) stress, the unfolded protein response (UPR), and MAPK signaling. Analysis of ER stress responses revealed an atypical induction of the UPR, characterized by the lack of induction of the PERK–eIF2α pathway in three complementary model systems: immortalized CF airway cells, fresh CF blood cells, and CF lung tissue. This atypical pattern of UPR activation was associated with the hyperinflammatory phenotype in CF cells, as deliberate induction of the PERK–eIF2α pathway with salubrinal attenuated the inflammatory response to both flagellin and Pseudomonas aeruginosa. IL-6 production triggered by ER stress and microbial stimulation were both dependent on p38 MAPK activity, suggesting a molecular link between both signaling events. These data indicate that atypical UPR activation fails to resolve the ER stress in CF and sensitizes the innate immune system to respond more vigorously to microbial challenge. Strategies to restore ER homeostasis and normalize the UPR activation profile may represent a novel therapeutic approach to minimize lung-damaging inflammation in CF. In cystic fibrosis (CF) lung disease, chronic airway infection and inflammation are the primary cause of morbidity and mortality (1). Clinical interventions targeting inflammation have proved to be beneficial, supporting the concept that lung inflammation is an attractive therapeutic target for improving CF outcomes (2–4). The only currently available approaches to reducing inflammation are global anti-inflammatories such as corticosteroids or ibuprofen, but the use of these medications is limited by unwanted side effects (5). To develop effective anti-inflammatory therapies, it is crucial to understand the specific biochemical mechanisms underlying the propagation of the inflammatory response in CF triggered by clinically relevant pathogens, such as Pseudomonas aeruginosa. The lung epithelium relies on innate immune receptors such as TLRs to recognize pathogens. We and others have shown that TLR5 (ligand: flagellin) plays a critical role in mediating much of the immune response to P. aeruginosa in vitro (6–8) and that a single nucleotide polymorphism rendering TLR5 less responsive is associated with improved clinical status in adult CF patients (7). TLR5 activation triggers signaling cascades such as the ERK (9) and p38 MAPK pathways (10, 11), which are potentially involved in mediating inflammatory responses to CF pathogens, yet fundamental questions remain concerning the links between CFTR mutations and dysregulated inflammatory signaling. The endoplasmic reticulum (ER) is a sensitive organelle, and perturbation of protein homeostasis (proteostasis) due to deficiencies in folding, trafficking, and degradation potentially contributes to the severity of a broad range of inflammatory conditions, such as chronic obstructive pulmonary disease (12) and autoimmune and neurodegenerative diseases (13, 14). In CF cells, many factors are likely to have an impact on proteostasis to trigger ER stress, including misfolded CFTR protein (15), chronic infection, and oxidant–antioxidant imbalance (16, 17). Nevertheless, the literature is not unanimous and data are conflicting on whether ER stress is induced in CF (18, 19). In the case of ER stress, the unfolded protein response (UPR) is activated to prevent overloading of the compartment. The classical UPR consists of three pathways initiated by the sensor proteins IRE-1α (inositol-requiring enzyme 1α), PERK (eukaryotic translation initiation factor 2-α kinase 3), and the transcription factor (TF) ATF6 (activating TF 6) (20). Together these three arms of the UPR mitigate ER stress by attenuating protein synthesis, facilitating protein folding, and increasing protein degradation. A number of studies have identified cross-talk mechanisms between the UPR and proinflammatory pathways, including NF-κB signaling (20–22). Consequently, the goal of this study was to investigate how the UPR and ER stress might contribute to the damaging hyper-inflammatory phenotype in CF. By combining computational with biochemical approaches, we identify dysregulation of the homeostatic UPR system in CF, which appears to potentiate TLR5 signaling. Thus strategies to correct dysregulated stress response pathways may represent a novel therapeutic approach to alleviate lung-damaging inflammation in CF. The well-characterized, immortalized airway epithelial cell lines IB3-1 (compound heterozygote for CF mutations ΔF508 and W1282X) and C38 (IB3-1 transfected with CFTR by adeno-associated viral vector) were cultured as described (23). PBMCs were isolated from whole blood obtained from healthy control and CF donors (sweat test and CF mutation positive) using published techniques (24). All CF patients were clinically stable at the time of blood donation, and subjects receiving systemic corticosteroid medications were excluded. Lung tissue from end-stage CF patients was obtained following transplantation. Control lung tissue was obtained from normal portions of the lung from patients undergoing surgery for lung cancer. All tissues were cryopreserved in tissue blocks. Studies were approved by the University of British Columbia Clinical Research Ethics Board (H09-01192), and informed consent was obtained from participants. Cells were seeded into 96-well plates 16 h prior to simulation and stimulated with optimized concentrations of flagellin (100 ng/ml; Invivogen), tunicamycin (20 μg/ml; Calbiochem), and/or P. aeruginosa PAO1 [multiplicity of infection (MOI) = 50:1]. For inhibitor studies, cells were incubated with a p38 MAPK inhibitor (SB203580, 1 μM; Cell Signaling) 1 h prior to exposure to tunicamycin (20 μg/ml) or flagellin (100 ng/ml). A specific inhibitor of the eIF2α phosphatase GADD34, salubrinal (100 μM; EMD), was applied 48 h prior to stimulation with flagellin or P. aeruginosa PAO1. IL-6 concentration was determined by ELISA (eBioscience). Cells were challenged with tunicamycin (20 μg/ml) for 2, 4, 6, 8, and 24 h or with salubrinal (100 μM) for 18, 24, and 30 h before mRNA was extracted for gene expression studies. Cell viability based on mitochondrial metabolic rate was measured by MTS assay (Promega). Total RNA was isolated with the RNeasy Plus Mini Kit (Qiagen) from IB3-1, C38, fresh PBMCs, or lung tissue cores and transcribed to cDNA with oligo-dT primers (High-Capacity cDNA Reverse Transcription Kit; Applied Biosystems). Quantitative PCR primers were designed for SYBR Green chemistry to amplify cyclophilin A (PPIA), IL-6, XBP-1u, XBP-1s, GRP78, DDIT3, ATF4, NRF2, and GADD34 (Table I) by standard cycling protocols, using a 7300 Real-Time PCR System (Applied Biosystems). Relative gene expression in the CF compared with non-CF cells was analyzed by the 2−ΔΔCt Livak method (25), using PPIA as a housekeeping gene. To accurately depict up- and downregulated gene expression patterns, the expression ratios were displayed as log2 transformed values. Cell lysates were analyzed by standard Western blotting protocols and were probed for p38, phospho-p38, phospho-eIF2α, and β-actin (#9212, 9211, 3597, 4967; Cell Signaling). Band densitometry was calculated with an Odyssey Infrared Imaging System (LI-COR). Cells were stimulated in six-well plates (BD Biosciences) with 1 μg/ml flagellin for 2 h. Cells were lysed, and total RNA was harvested. RNA quality was determined using Bioanalyzer 2100 (Agilent Technologies). cDNA was synthesized using an RNA ampULSe kit (Kreatech), hybridized to human HT-12 expression bead chips and raw data processed with BeadStudio v3.4.0 (Illumina). Microarray data were deposited to the publically viewable National Center for Biotechnology Information Gene Expression Omnibus (accession number GSE35391, http://www.ncbi.nlm.nih.gov/geo/). Further processing was performed using Bioconductor (http://www.bioconductor.org/) for quantile normalization. Differential expression of gene probes was calculated using the limma package with empirical Bayes (26). Adjusted p values were calculated using the Benjamini-Hochberg method (27). Gene ontology (GO; http://geneontology.org) overrepresentation analysis (ORA) was calculated using GOstats (28), whereas ORA of TFs based on differentially expressed (DE) targets was calculated using CORNA (29), with data from TRANSFAC PRO (29), processed using the InnateDB Project (30). Network analysis was carried out as previously described (30, 31). Briefly, a list of protein-level interactions between DE genes (FC > ±1.4; p < 0.05) was obtained using InnateDB (32). Network analysis was carried out by visualizing these interactions into a single integrated network using Cytoscape (2.8.0 for Windows) and the software plugin Cerebral to appreciate cellular directionality, as previously described (33). Hub degree (or the number of protein-level interactions with other members of the network) was determined for each gene “node” in the network using cytoHubba (34). Further enrichment of the network was performed through the manual addition of interactions based on primary literature (35), focusing on genes curated in the KEGG pathway Protein processing in endoplasmic reticulum [KEGG:HSA04141] (36). It remains unclear which molecular events in CF lead to excessive immune responses to flagellated pathogens such as P. aeruginosa. To generate testable hypotheses concerning the mechanisms underlying this increased immune response, gene expression profiling was performed on IB3-1 and C38 cells at baseline and 2 h after flagellin stimulation. The data were subjected to computational analysis using complementary approaches of GO and TF ORA methods (Tables II–IV). In addition, a comprehensive network of protein-level interactions between DE genes in IB3-1 compared to C38 cells was constructed (Fig. 1). The goal of this analysis was to facilitate unbiased identification of the transcriptional processes contributing to the increased responsiveness of immortalized CF airway cells to flagellin. 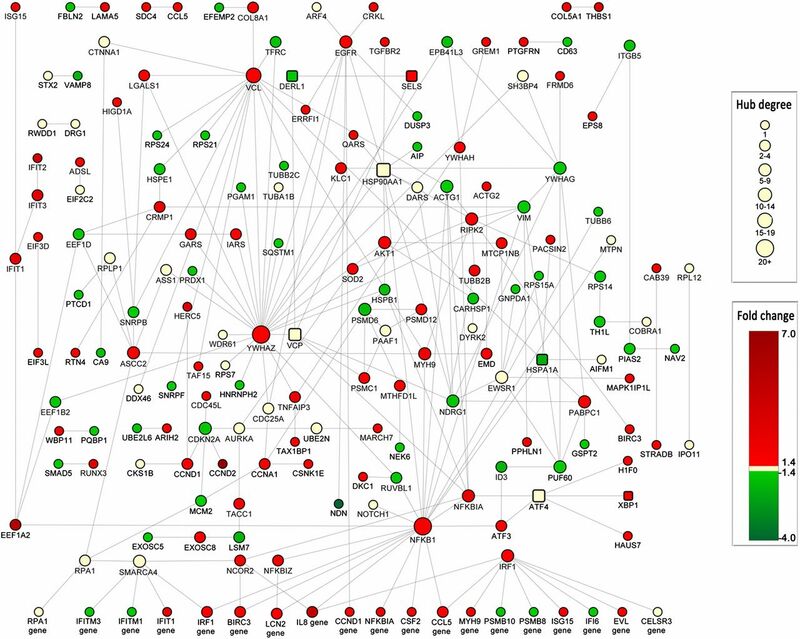 Protein-interaction network after flagellin stimulation. Nodes curated as components of ER stress responses are shown as squares. Node size is proportional to its hub degree (interconnectivity within the network), whereas node color is proportional to the fold change of expression in IB3-1 cells compared with C38 cells (red, upregulated; green, downregulated). We investigated GO terms to identify global molecular themes dysregulated in IB3-1 compared with C38 cells. Multiple GO terms (categorized as Biological Process) related to both ER stress and the innate immune response were significantly different between the cell lines (Tables II, III). These findings were further reinforced by the TF ORA, which returned a signature of TFs associated with the UPR (XBP-1, ATF6, DDIT3) as well as TFs activated downstream of the p38 MAPK signaling pathway related to inflammatory cytokine production (NF-κB, CREB1, AP-1) (Table IV). When DE genes between cell lines were visualized graphically, DE genes related to ER stress and UPR were present in the network (Fig. 1). NF-κB (NFKB1) was not significantly different between IB3-1 and C38 under unstimulated conditions but, after flagellin treatment, was upregulated in IB3-1 and centered as one of the largest and most prominent hubs in the network, orchestrating the downstream upregulation of immune genes. Most strikingly, multiple gene nodes related to ER stress and UPR were found to be interacting with NF-κB, either directly through NFKB1 (such as HSP90AA1 and HSPA1A) or indirectly through NFKBIA (such as VCP and XBP1-ATF4). Taken together, this analysis revealed a pattern of enhanced inflammatory signaling in conjunction with ER stress, the UPR, and general stress response pathways in flagellin-stimulated immortalized CF cell lines. On this basis, we hypothesized that the integration of these pathways in CF cells was contributing to their heightened proinflammatory responses. To validate the computational predictions, we established the reliability of a panel of commonly accepted ER stress/UPR markers by treating IB3-1 and C38 cells with the ER stress inducer tunicamycin and measuring the expression of genes influenced by the three arms of the UPR: IRE-1 (XBP-1u, XBP-1s), ATF6 (GRP78), and PERK (GADD34, ATF4, NRF2, DDIT3) (37, 38). Tunicamycin induces ER stress by inhibiting N-linked glycosylation. Consistent with current understanding of the UPR, all gene expression increased in a time-dependent fashion except XBP-1u, which decreased as expected because under conditions of ER stress, XBP-1u is processed by IRE-1 to generate XBP-1s. NRF2 changes were modest, and this marker was not included in subsequent UPR analysis (Fig. 2A–D). Tunicamycin induces expression of UPR markers. IB3-1 (A, C) and C38 (B, D) cells were treated with tunicamycin (20 μg/ml) for 24 h (n = 3), and XBP-1u, XBP-1s, GRP78, GADD34, ATF4, NRF2, and DDIT3 expression was measured. Expression values were normalized to the housekeeping gene PPIA and are relative to baseline. Data are expressed as a log2 ratio and represent mean ± SEM. To ensure the validity and generalizability of our findings, we next profiled UPR activation in three complementary human model systems: immortalized CF and control airway epithelial cells, primary PBMCs from CF patients and healthy controls, and CF and control primary lung tissue (Fig. 3A, 3C, 3D, respectively). The active form of XBP-1, XBP-1s, was consistently overexpressed in the CF cells, validating our computational predictions and indicating that the IRE-1 arm of the UPR was active in these CF samples. In contrast, ATF4, GADD34, DDIT3, and GRP78 expression was not induced in parallel with XBP-1s, suggesting the PERK–eIF2α arm of the UPR is not activated in CF cells in all three model systems. A significant lack of activation of the PERK–eIF2α arm of the UPR in immortalized CF airway epithelial cells was confirmed at the protein level, as phosphorylation of eIF2α was lower in CF than in control cells (Fig. 3B). This unanticipated finding provides evidence of both ER stress in CF cells and an atypical activation of the UPR in immortalized CF airway cells. Pattern of UPR activation in immortalized CF airway cells, blood cells, and lung tissue. 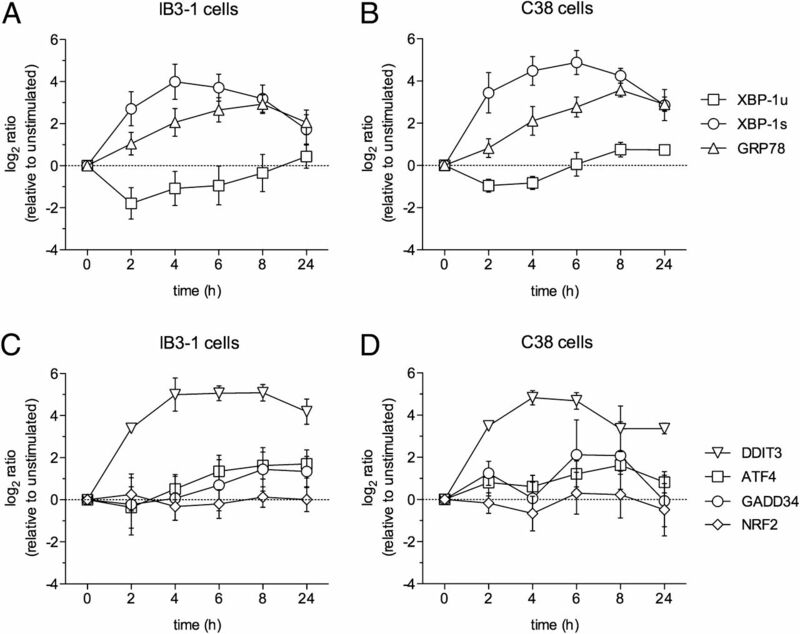 Expression of UPR markers XBP-1u, XBP-1s, GRP78, GADD34, ATF4, and DDIT3 at unstimulated conditions in (A) IB3-1/C38 cells (n = 3), (C) CF PBMCs (n = 8), and (D) tissue from lung explants (n = 4) compared with their non-CF controls. Expression values were normalized to the housekeeping gene PPIA and are relative to baseline. Data are expressed as a log2 ratio and represent mean ± 95% confidence interval. *p < 0.05. 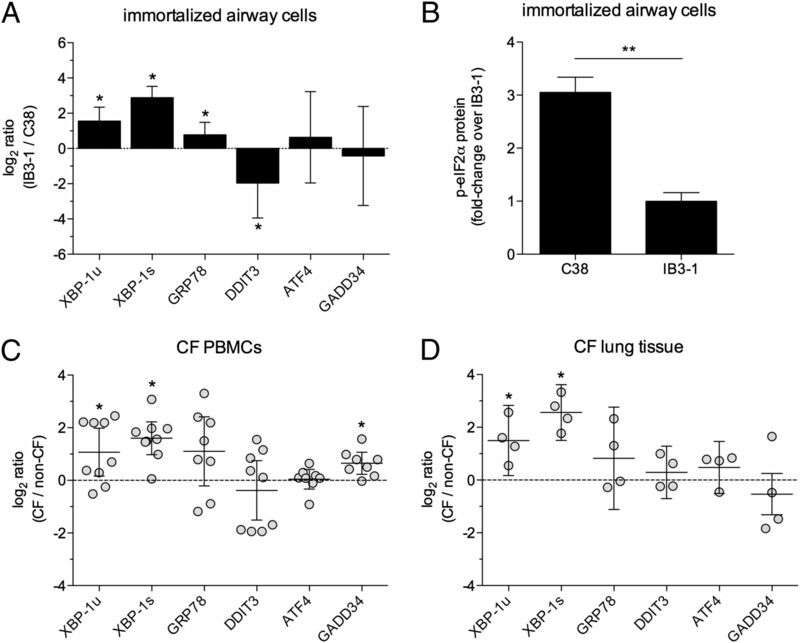 (B) Phospho(p)-eIF2α protein levels in CF (IB3-1) and non-CF (C38) airway cells were determined by Western blot and quantified by densitometry (n = 3). Statistical comparison was performed by t test. **p < 0.01. Having identified an atypical pattern of UPR activation in CF cells in which the IRE-1 pathway was activated, in contrast to the absence of PERK–eIF2α pathway induction, we examined whether deliberate activation of the PERK–eIF2α pathway would beneficially modulate the inflammatory response pattern of CF airway cells. Upon activation of PERK, eIF2α is phosphorylated, which leads to ATF4-dependent transcription of DDIT3. This pathway is negatively regulated by the phosphatase GADD34, which dephosphorylates eIF2α. Salubrinal, a specific pharmacological inhibitor of GADD34, upregulates this pathway, as demonstrated by increased phosphorylation of eIF2α and induction of DDIT3 expression (Fig. 4A, 4B). Pharmacological activation of the PERK–eIF2α pathway through preincubation of IB3-1 cells with salubrinal (30 h) attenuated the inflammatory response to flagellin (p < 0.001) and P. aeruginosa (PAO1, MOI = 50:1; p < 0.001) (Fig. 4C, 4D). Importantly, salubrinal treatment did not significantly affect cell viability, as measured by MTS assay (data not shown). Salubrinal attenuates proinflammatory cytokine production in immortalized CF cells. Activation of the PERK–eIF2α pathway attenuates the inflammatory immune response to flagellin and P. aeruginosa (PAO1). (A) The PERK–eIF2α pathway showing phospho-eIF2α protein levels in IB3-1 cells by Western blot following salubrinal treatment (6 h, 100 μM). (B) Treatment of IB3-1 cells with salubrinal (30 h, 100 μM) induces DDIT3 expression, with the change in DDIT3 expression from unstimulated and salubrinal treated (inset, n = 3). Expression values were normalized to the housekeeping gene PPIA and are relative to baseline. Data are expressed as a log2 ratio and represent mean ± 95% confidence interval. *p < 0.05. (C and D) IB3-1 cells were treated with salubrinal (48 h, 100 μM) prior to flagellin (14 h, 100 ng/ml) or live PAO1 (4 h, MOI = 50:1) stimulation (n = 3). Data are expressed as mean ± SEM and analyzed by ANOVA using the Bonferroni posttest. ***p < 0.001. With the goal of increasing our mechanistic understanding of inflammation in CF and ascertaining potential anti-inflammatory targets, we sought to identify the molecular pathways integrating ER stress, the UPR, and innate immune signaling. Informed by the results of our gene expression profiling (Tables II–IV) and literature reports implicating p38 MAPK signaling in CF inflammation (11, 39), the activity of p38 MAPK was evaluated in response to flagellin stimulation. Flagellin triggered an increased and prolonged phosphorylation of p38 MAPK in IB3-1 cells compared with control cells (Fig. 5). This differential signaling was biologically relevant, as treatment of CF cells with the specific p38 MAPK inhibitor SB203580 reduced the exaggerated proinflammatory immune response to baseline (Fig. 6A). These data validate the results from the gene expression array analysis, suggesting that p38 MAPK activity plays a significant role in the proinflammatory immune response of IB3-1 cells to flagellin. Increased activation of p38 MAPK signaling in immortalized CF cells. 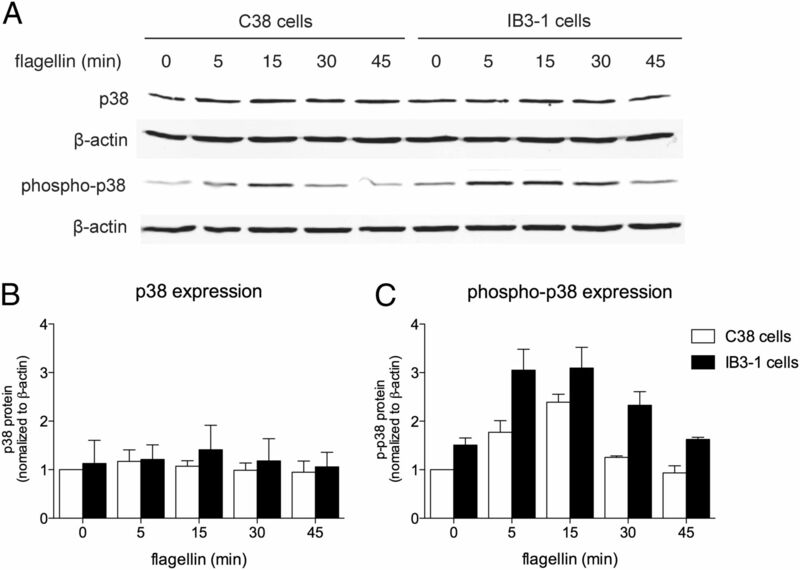 Phosphorylation of p38 MAPK is increased and prolonged upon flagellin stimulation in IB3-1 compared with C38 cells. (A) Cells were stimulated with flagellin for 0, 5, 15, 30, and 45 min. Total and phospho-p38 MAPK were evaluated by Western blot. Densitometry for both cell lines was calculated and normalized to β-actin and unstimulated C38 and is shown for (B) p38 and (C) phospho-p38 (n = 3). Statistical comparison between C38 and IB3-1 of phospho-p38 was performed by t test after calculating the area under the curve (p < 0.05). The flagellin- and tunicamycin-induced IL-6 responses are dependent on p38 MAPK activity. (A) Induction of ER stress with tunicamycin (6 h, 20 μg/ml) prior to flagellin stimulation significantly potentiates the proinflammatory immune response in immortalized CF cells. Pretreatment of IB3-1 cells with SB203580 (1 h, 1 μM) prior to flagellin (14 h, 100 ng/ml) or tunicamycin stimulation significantly decreases IL-6 production in (A) CF and (B) non-CF cell lines. Statistical analysis was performed by ANOVA using the Bonferroni posttest. Data are derived from at least three independent experiments. *p < 0.05, **p < 0.01, ***p < 0.001. To investigate a potential link between ER stress and inflammation, we next sought to determine if ER stress–augmented inflammatory responses were also mediated by p38 MAPK. The level of ER stress was artificially enhanced by preincubation with tunicamycin. Subsequent stimulation with flagellin resulted in an augmented IL-6 response in both cell lines (Fig. 6A, 6B), suggesting that existing and increasing perturbation of the ER can potentiate the inflammatory immune response of immortalized airway epithelial cells. Similar to flagellin responses, the differences in tunicamycin-induced IL-6 were greater in IB3-1 than in C38 (p < 0.05). This ER stress–induced IL-6 production was dependent upon p38 MAPK activity, as pretreatment with SB203580 abrogated the IL-6 response to tunicamycin (Fig. 6A, 6B). Finally, to confirm that ER stress contributes to flagellin-induced p38 MAPK-dependent inflammatory gene expression, we demonstrated that SB203580 abolished IL-6 production from cells treated with both tunicamycin and flagellin (Fig. 6A, 6B). 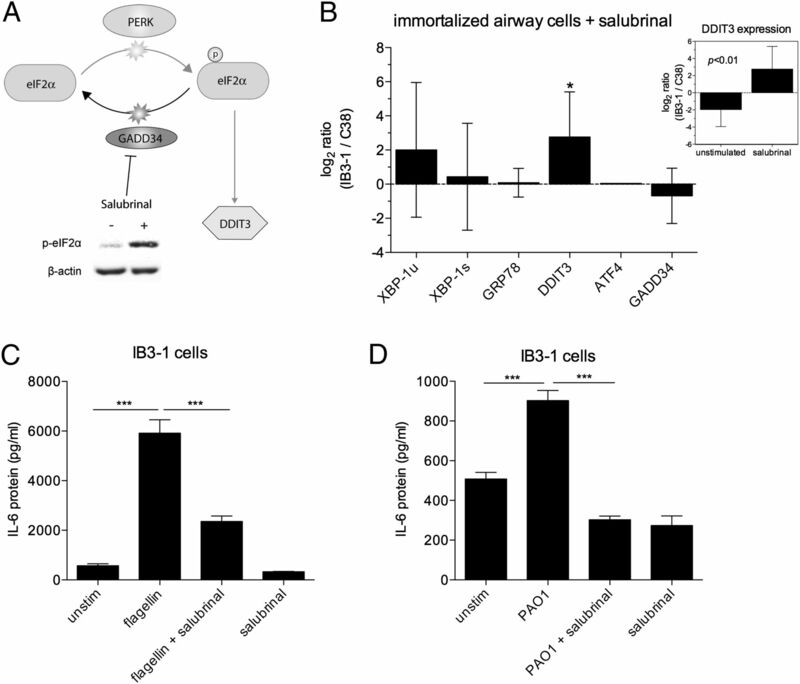 Together these data suggest that in IB3-1 cells, signaling and transcriptional pathways activated by ER stress and flagellin are mechanistically linked through p38 MAPK signaling, and that this pathway convergence in turn contributes to augmented inflammatory responses of immortalized CF airway cells. Inflammatory lung disease is the major cause of morbidity and mortality in CF. Although nonspecific anti-inflammatory medications (i.e., corticosteroids, ibuprofen) have been beneficial in clinical trials in slowing the decline in lung function in CF, clinical uptake is low owing to unacceptable side effects, such as growth impairment, weight gain, and risk of gastrointestinal bleeding. However, this “proof-of-concept” evidence has been the rationale in many studies for understanding the specific pathways mediating the increased inflammatory response to bacterial infection in CF, all with the goal of guiding the development of safe and effective anti-inflammatory therapies. Our group and others have generated evidence highlighting the importance of innate immune receptors, particularly TLR5, in mediating inflammatory responses to P. aeruginosa in CF (7, 9, 40). The mechanism or mechanisms underlying the increased immune response in CF, however, remain unknown. This study aimed to identify pathways involved in the increased proinflammatory cytokine production occurring in CF in response to microbial stimuli. Our global gene expression profiling reflected a general theme of activated stress response mechanisms in immortalized CF airway cells that was already present at baseline, suggesting disturbance of cellular homeostasis. In particular, ER stress response mechanisms and the UPR were indicated in the GO and TF ORA (Tables II–IV), consistent with previous studies identifying an increased level of ER stress in CF cells, potentially due to misfolded CFTR (41, 42). In addition to these results, network analysis revealed direct and indirect interactions between ER stress pathway mediators and NF-κB–dependent transcription of inflammatory mediators (Fig. 1). In the case of ER stress, the UPR is activated by a variety of insults that disturb proteostasis. Three general mechanisms have evolved to restore ER homeostasis—increase in the protein folding capacity, attenuation of translation, and upregulation of the degradation machinery (ER-associated degradation, autophagy) (43). It is important to appreciate that in addition to misfolding of mutated CFTR protein, many factors are likely to have an impact on proteostasis to trigger ER stress in CF, including oxidative stress (11, 16, 17, 44–46), chronic infection (47), and decreased functionality of ER stress relief mechanisms, such as autophagy (21). Nevertheless, the literature contains conflicting results concerning the presence of ER stress in CF and the potential contribution of ER stress to CF inflammatory disease. Several studies report that ΔF508, the mutation found in 70% of all CF patients, is retained within the ER, leading to upregulation of protein degradation and ER stress markers indicative of unbalanced ER homeostasis (15, 42, 48–51). More specifically, Martino et al. (52, 53) showed that XBP-1s is overexpressed in CF cells and the inflammatory responses in CF cells were dependent upon the action of this TF. In contrast, Hybiske et al. (19) reported that no difference can be noted in ER stress, NF-κB signaling, and IL-8 production in CF cells compared with control cells; whereas Nanua et al. (18) found that neither XBP-1 splicing nor eIF2α phosphorylation was increased in CF cells compared with controls, suggesting that classical UPR activation is absent in CF cells. Our study expands the literature concerning ER stress and the UPR in CF. Although we confirmed an increased activity of the IRE-1 pathway in CF (evident by overexpression of XBP-1s), we also observed a lack of induction of the PERK–eIF2α pathway (evident by the lack of DDIT3 induction and low levels of phospho-eIF2α at baseline conditions) (Fig. 3). However, we were able to induce the PERK–eIF2α pathway in the immortalized CF airway cells with ER stress inducer tunicamycin, indicating that in this model system this pathway is not defective but, rather, inactivated. A potential weakness of our study design was the use of immortalized airway cells. Indeed, C38 cells, although “corrected,” express not only wild-type CFTR but also mutant CFTR that still has the potential to induce ER stress. To specifically address this weakness, we validated this atypical pattern of UPR activation in both fresh blood cells and lung tissue from patients with CF (Fig. 3C, 3D). We also acknowledge that inflammation is a potential cause for ER stress (52–54), and with respect to the CF lung tissues (Fig. 3D), a clear interpretation of whether the increased UPR evident in these samples is due to inflammation or protein misfolding cannot be made. It has been suggested that this atypical pattern of UPR activation may be a fundamental cellular adaptation to chronic ER stress (55–57). PERK–eIF2α signaling is rapidly downregulated as a consequence of negative feedback loops within the UPR, which might indicate that long-term activation of this signaling axis is deleterious perhaps because of upregulation of CHOP and its targets (58, 59). We hypothesized that this incomplete activation of the UPR was associated with the increased proinflammatory phenotype in CF by dysregulating inflammatory signaling events. We used two complementary approaches to test this hypothesis. First, we artificially increased ER stress in IB3-1 cells and subsequently stimulated with flagellin. Increased levels of ER stress exacerbated the IL-6 response to TLR5 signaling (Fig. 6A), supporting the hypothesis that imbalanced ER homeostasis augments proinflammatory TLR5 signaling. Second, on the basis of the evolutionary assumption that activation of the UPR network is beneficial in restoring cellular homeostasis, we elected to activate the PERK–eIF2α arm of the UPR rather than inhibiting the overactivated IRE-1–XBP-1 arm [as was performed by Martino et al. (52)]. Salubrinal inhibits GADD34 (60) and thus constitutively activates this pathway, as evidenced by the phosphorylation of eIF2α and the induction of DDIT3 expression (Fig. 4). Intriguingly, preconditioning of immortalized CF airway cells with salubrinal significantly reduced the proinflammatory IL-6 response following exposure to both flagellin and live P. aeruginosa (Fig. 4C, 4D). Although reports have shown that inflammation is a potential cause for ER stress (52–54) and the data in Fig. 3D do not rule out that the increased inflammatory state leads to activation of the UPR, our results strongly suggest that this atypical activation of the ER stress response is associated with the proinflammatory phenotype of IB3-1 cells in response to infectious stimuli. Our study was not designed to examine all consequences of atypical UPR activation in CF, but it is likely that incomplete activation of stress response mechanisms, such as the UPR, sensitize the cell to innate immune signaling. Recently, two important stress response mechanisms have been reported to be dysfunctional in CF. The antioxidant response mediated by the TF NRF2 has been shown to be defective in CF cells, leading to increased oxidative stress and inflammatory responses (17). Autophagy, a catabolic process by which cells degrade dysfunctional content and organelles during periods of stress, is known to be activated by ER stress (61, 62); in turn, autophagy has been reported to decrease ER stress (63). Recently, Luciani et al. (21) reported that CF cells failed to induce autophagy in response to nutrient starvation, indicating that this important relief mechanism is dysfunctional in CF cells. Intriguingly, some reports have suggested that both the NRF2-mediated antioxidant response and autophagy are under the control of the PERK–eIF2α pathway (64–66). Thus, in the case of decreased induction of this pathway upon ER stress, homeostasis is not restored, possibly leading to sensitization of proinflammatory signaling events. Our finding of atypical UPR activation in CF led us to investigate the link between imbalanced ER homeostasis and proinflammatory innate immune signaling. Numerous studies have shown that the proinflammatory response to infection is dysregulated in the CF airway. The mere absence of CFTR can induce increased NF-κB signaling (67, 68), supporting the concept that CF cells are at least more responsive to inflammatory stimuli, if not already proinflammatory, in the absence of infection. The results returned by our gene expression profiling prompted our investigation of the kinases involved in the transduction of the proinflammatory signal. In particular, we focused on p38 MAPK, which plays a well-established role in the TLR signaling cascade (10). Activation of p38 MAPK after stimulation with flagellin was significantly increased and prolonged in CF compared with control cells (Fig. 5), confirming the report by Bérubé et al. (11) showing the same phenomenon in a different set of CF (CuFi) and non-CF (NuLi) cell lines. Moreover, treatment with the specific p38 MAPK inhibitor SB203580 normalized the increased proinflammatory immune response in CF cells (Fig. 6). Although these data confirmed the role of p38 MAPK in increased innate immune responses in CF cells, it remains unclear what potentiates p38 signaling in CF cells. Although studies have reported links between the UPR and apoptotic MAPK signaling (69), none have been reported between UPR activity and proinflammatory p38 MAPK signaling. Several TFs distal to p38 MAPK signaling in conjunction with evidence of ER stress were returned in the TF ORA, indicating a link between the two signaling entities. Our data provide evidence that the strong IL-6 response elicited by the induction of ER stress was dependent on p38 MAPK activity (Fig. 6). The fact that p38 inhibition decreased both ER stress–induced and TLR5-mediated inflammation indicates that both pathways use p38 MAPK to induce IL-6 production. Thus, increased levels of ER stress may provide the additional signal resulting in the prolonged and increased activation of p38 MAPK in IB3-1 cells. In summary, the disturbance of cellular homeostasis in CF resulting from the combination of intrinsic factors (genetic mutations in CFTR) and extrinsic factors (oxidative stress, decreased autophagy, and chronic infection) can cause ER stress. We investigated the activation profile of the UPR in CF cells and observed that the PERK–eIF2α arm of the UPR is not induced in CF cells. We report, to our knowledge, for the first time that this atypical activation of the UPR is associated with the hyperinflammatory phenotype of immortalized CF airway cells, as deliberate, therapeutic activation of the PERK–eIF2α pathway in IB3-1 cells attenuates proinflammatory immune responses to microbial stimuli. Furthermore, we provide evidence that unopposed ER stress induces inflammatory responses dependent on p38 MAPK activity, suggesting that ER stress provides an additional signal leading to increased and prolonged p38 MAPK activation, culminating in an exaggerated proinflammatory innate immune response. Strategies to restore ER homeostasis, normalize the UPR, and alleviate ER stress may prove useful in controlling the damaging proinflammatory immune response occurring in the airways of people with CF. We thank patients, families, and staff at the BC Children’s Hospital Cystic Fibrosis Clinic, Vancouver, BC, Canada, for support of this research. This work was supported by Cystic Fibrosis Canada and a Clinical Research Scholar Award from the Michael Smith Foundation for Health Research. The microarray data presented in this article have been submitted to the National Center for Biotechnology Information Gene Expression Omnibus (http://www.ncbi.nlm.nih.gov/geo/) under accession number GSE35391.
. 2007. Inflammation and anti-inflammatory therapies for cystic fibrosis. Clin. Chest Med. 28: 331–346.
. 1985. Alternate-day prednisone reduces morbidity and improves pulmonary function in cystic fibrosis. Lancet 2: 686–688.
. 1995. Effect of high-dose ibuprofen in patients with cystic fibrosis. N. Engl. J. Med. 332: 848–854.
. 2007. High-dose ibuprofen in cystic fibrosis: Canadian safety and effectiveness trial. J. Pediatr. 151: 249–254.
. 2000. Risk of persistent growth impairment after alternate-day prednisone treatment in children with cystic fibrosis. N. Engl. J. Med. 342: 851–859.
. 2008. Innate immunity mediated by TLR5 as a novel antiinflammatory target for cystic fibrosis lung disease. J. Immunol. 180: 7764–7773.
. 2010. TLR5 as an anti-inflammatory target and modifier gene in cystic fibrosis. J. Immunol. 185: 7731–7738.
. 2005. Human airway epithelial cells sense Pseudomonas aeruginosa infection via recognition of flagellin by Toll-like receptor 5. Infect. Immun. 73: 7151–7160.
. 2006. AsialoGM1 and TLR5 cooperate in flagellin-induced nucleotide signaling to activate Erk1/2. Am. J. Respir. Cell Mol. Biol. 34: 653–660.
. 2007. The p38 mitogen-activated protein kinase signaling pathway is coupled to Toll-like receptor 5 to mediate gene regulation in response to Pseudomonas aeruginosa infection in human airway epithelial cells. Infect. Immun. 75: 5985–5992.
. 2010. Loss of cystic fibrosis transmembrane conductance regulator function enhances activation of p38 and ERK MAPKs, increasing interleukin-6 synthesis in airway epithelial cells exposed to Pseudomonas aeruginosa. J. Biol. Chem. 285: 22299–22307.
. 2009. Heightened endoplasmic reticulum stress in the lungs of patients with chronic obstructive pulmonary disease: the role of Nrf2-regulated proteasomal activity. Am. J. Respir. Crit. Care Med. 180: 1196–1207.
. 2008. Adapting proteostasis for disease intervention. Science 319: 916–919.
. 2010. Protein homeostasis and aging in neurodegeneration. J. Cell Biol. 190: 719–729.
. 1998. Delta F508 CFTR localizes in the endoplasmic reticulum-Golgi intermediate compartment in cystic fibrosis cells. Exp. Cell Res. 242: 144–152.
. 2000. Oxidative stress and regulation of glutathione in lung inflammation. Eur. Respir. J. 16: 534–554.
. 2008. Dysfunction of Nrf-2 in CF epithelia leads to excess intracellular H2O2 and inflammatory cytokine production. PLoS ONE 3: e3367.
. 2006. Absence of typical unfolded protein response in primary cultured cystic fibrosis airway epithelial cells. Biochem. Biophys. Res. Commun. 343: 135–143.
. 2007. Effects of cystic fibrosis transmembrane conductance regulator and DeltaF508CFTR on inflammatory response, ER stress, and Ca2+ of airway epithelia. Am. J. Physiol. Lung Cell. Mol. Physiol. 293: L1250–L1260. 2010. Endoplasmic reticulum stress and the inflammatory basis of metabolic disease. Cell 140: 900–917.
. 2010. Defective CFTR induces aggresome formation and lung inflammation in cystic fibrosis through ROS-mediated autophagy inhibition. Nat. Cell Biol. 12: 863–875.
. 2010. Endoplasmic reticulum stress-activated C/EBP homologous protein enhances nuclear factor-kappaB signals via repression of peroxisome proliferator-activated receptor gamma. J. Biol. Chem. 285: 35330–35339.
. 1991. A cystic fibrosis bronchial epithelial cell line: immortalization by adeno-12-SV40 infection. Am. J. Respir. Cell Mol. Biol. 4: 313–319.
. 2007. Prevalence of Toll-like receptor signalling defects in apparently healthy children who developed invasive pneumococcal infection. Clin. Immunol. 122: 271–278. Smyth, G. K. 2004. Linear models and empirical bayes methods for assessing differential expression in microarray experiments. Stat. Appl. Genet. Mol. Biol. 3:Article3.
. 1995. Controlling the false discovery rate: a practical and powerful approach to multiple testing. J. R. Stat. Soc. Series B Stat. Methodol. 57: 289–300.
. 2007. Using GOstats to test gene lists for GO term association. Bioinformatics 23: 257–258.
. 2009. CORNA: testing gene lists for regulation by microRNAs. Bioinformatics 25: 832–833.
. 2008. InnateDB: facilitating systems-level analyses of the mammalian innate immune response. Mol. Syst. Biol. 4: 218.
. 2011. The Pseudomonas aeruginosa autoinducer 3O-C12 homoserine lactone provokes hyperinflammatory responses from cystic fibrosis airway epithelial cells. PLoS ONE 6: e16246.
. 2010. Curating the innate immunity interactome. BMC Syst. Biol. 4: 117.
. 2008. Hubba: hub objects analyzer—a framework of interactome hubs identification for network biology. Nucleic Acids Res. 36: W438–443.
. 2008. Getting started in biological pathway construction and analysis. PLOS Comput. Biol. 4: e16.
. 2010. KEGG for representation and analysis of molecular networks involving diseases and drugs. Nucleic Acids Res. 38(Database issue): D355–D360.
. 2010. Methods for monitoring endoplasmic reticulum stress and the unfolded protein response. Int. J. Cell Biol. 2010: 830307.
. 2010. ER stress and the unfolded protein response in intestinal inflammation. Am. J. Physiol. Gastrointest. Liver Physiol. 298: G820–G832.
. 2009. Radioresistant cells expressing TLR5 control the respiratory epithelium’s innate immune responses to flagellin. Eur. J. Immunol. 39: 1587–1596.
. 2002. DeltaF508-CFTR causes constitutive NF-kappaB activation through an ER-overload response in cystic fibrosis lungs. Biol. Chem. 383: 271–282.
. 2007. Coupling cystic fibrosis to endoplasmic reticulum stress: differential role of Grp78 and ATF6. Biochim. Biophys. Acta 1772: 1236–1249.
. 2010. Role of endoplasmic reticulum stress in cystic fibrosis-related airway inflammatory responses. Proc. Am. Thorac. Soc. 7: 387–394.
. 2011. P. aeruginosa drives CXCL8 synthesis via redundant toll-like receptors and NADPH oxidase in CFTR∆F508 airway epithelial cells. J. Cyst. Fibros. 10: 107–113.
. 2009. The triterpenoid CDDO limits inflammation in preclinical models of cystic fibrosis lung disease. Am. J. Physiol. Lung Cell. Mol. Physiol. 297: L828–L836.
. 2009. Cystic fibrosis-related diabetes: from CFTR dysfunction to oxidative stress. Clin. Biochem. Rev. 30: 153–177.
. 2004. Lung inflammation as a therapeutic target in cystic fibrosis. Am. J. Respir. Cell Mol. Biol. 31: 377–381.
. 2008. Activation of the unfolded protein response by deltaF508 CFTR. Am. J. Respir. Cell Mol. Biol. 39: 448–457.
. 2009. Mechanisms of the noxious inflammatory cycle in cystic fibrosis. Respir. Res. 10: 23.
. 2010. Rescue of F508del-CFTR by RXR motif inactivation triggers proteome modulation associated with the unfolded protein response. Biochim. Biophys. Acta 1804: 856–865.
. 2006. Selective inhibition of endoplasmic reticulum-associated degradation rescues DeltaF508-cystic fibrosis transmembrane regulator and suppresses interleukin-8 levels: therapeutic implications. J. Biol. Chem. 281: 17369–17378.
. 2009. Airway epithelial inflammation-induced endoplasmic reticulum Ca2+ store expansion is mediated by X-box binding protein-1. J. Biol. Chem. 284: 14904–14913.
. 2005. Chronic airway infection/inflammation induces a Ca2+i-dependent hyperinflammatory response in human cystic fibrosis airway epithelia. J. Biol. Chem. 280: 17798–17806.
. 2005. Cystic fibrosis airway epithelial Ca2+ i signaling: the mechanism for the larger agonist-mediated Ca2+ i signals in human cystic fibrosis airway epithelia. J. Biol. Chem. 280: 10202–10209.
. 2007. That which does not kill me makes me stronger: adapting to chronic ER stress. Trends Biochem. Sci. 32: 469–476.
. 2011. The unfolded protein response: from stress pathway to homeostatic regulation. Science 334: 1081–1086. 2012. The unfolded protein response: controlling cell fate decisions under ER stress and beyond. Nat. Rev. Mol. Cell Biol. 13: 89–102.
. 2003. Inhibition of a constitutive translation initiation factor 2alpha phosphatase, CReP, promotes survival of stressed cells. J. Cell Biol. 163: 767–775.
. 2009. Chronic endoplasmic reticulum stress activates unfolded protein response in arterial endothelium in regions of susceptibility to atherosclerosis. Circ. Res. 105: 453–461.
. 2005. A selective inhibitor of eIF2alpha dephosphorylation protects cells from ER stress. Science 307: 935–939.
. 2006. Autophagy is activated for cell survival after endoplasmic reticulum stress. Mol. Cell. Biol. 26: 9220–9231.
. 2010. ER stress negatively regulates AKT/TSC/mTOR pathway to enhance autophagy. Autophagy 6: 239–247.
. 2007. Linking of autophagy to ubiquitin-proteasome system is important for the regulation of endoplasmic reticulum stress and cell viability. Am. J. Pathol. 171: 513–524.
. 2006. Coordination of ER and oxidative stress signaling: the PERK/Nrf2 signaling pathway. Int. J. Biochem. Cell Biol. 38: 317–332.
. 2004. PERK-dependent activation of Nrf2 contributes to redox homeostasis and cell survival following endoplasmic reticulum stress. J. Biol. Chem. 279: 20108–20117.
. 2008. Sorting, recognition and activation of the misfolded protein degradation pathways through macroautophagy and the proteasome. Autophagy 4: 141–150.
. 2010. Expression of wild-type CFTR suppresses NF-kappaB-driven inflammatory signalling. PLoS ONE 5: e11598.
. 2009. CFTR is a negative regulator of NFkappaB mediated innate immune response. PLoS ONE 4: e4664.
. 2005. The mammalian unfolded protein response. Annu. Rev. Biochem. 74: 739–789.